Inder Loves Folk Art: Dog tolerance guidelines. Isn't this great? Among other things, it shows that with careful management, you can get a bunch of pit bulls, of various dog-tolerance levels, to pose together for a photo (I imagine there were treats involved - look at those intent stares!). It is important for pit bull lovers and advocates to remember the breeding of these dogs. To put it bluntly: Dog-aggression has been bred into these dogs for centuries and is relatively common in pit bulls. Dog-tolerance varies from dog to dog, can be managed, and should not discourage anyone from adopting a pit bull. But responsible pit bull owners need to be aware of the issue. After mature, unneutered males (fix your dog, people! ), mature females are the most likely to display anti-dog-social behavior. Dog tolerance can decline with maturity. For example, our Omie was dog-social as a puppy, but has matured to be dog-selective at best. She gets along well with her dog "friends" who, like her lil' bro Crouton, are almost all male, but needs to be closely supervised with other mature female dogs. As Bad Rap says: "Can be described as 'bitchy.'" That's our Omie! So, if you come to visit us, please don't surprise us by bringing your mature, female dog in tow to "play" with Omie! We don't like that kind of surprise. A nice bottle of sparkling wine, on the other hand, is always welcome. I'm obviously a big fan of pits, but I think it's important to discuss the difficult aspects of the breed as well as the more snuggly aspects. I don't want to give my readers the impression that I believe that all pit bulls are all love-bugs in all circumstances. The truth is, this is an unrealistic expectation to carry about any breed of dog. 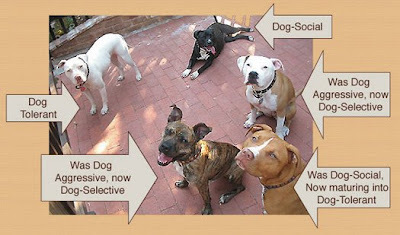 But because of the stereotypes and media hype, pit bull owners need to be especially conscious of their dogs' breeding, and train their dogs accordingly. Denial doesn't do the breed any favors. Bad Rap does such an excellent, evenhanded job with this. Yay, Bad Rap! That should satisfy me for a while on the pit bull front. Thanks for reading!